LINCOLN, Nebraska — Following another year of above-average precipitation, Nebraska groundwater levels continued to rise in the areas most affected by the 2012 drought, according to a new report from the Conservation and Survey Division at the University of Nebraska-Lincoln. Still, some portions of the state recorded levels below that of the pre-drought years. The annual statewide report, part of a nation-leading groundwater-level monitoring program, examines short-term groundwater rises and declines measured in 5,365 regional wells from spring 2017 to spring 2018, but it also looks at long-term trends since monitoring began in the 1930’s. The long-term trends show both the rises and declines in the groundwater levels when compared to pre-development records. The greatest declines of about 122 feet are recorded in western Nebraska in areas with high irrigation-well densities in aquifers that have little or no connection with surface water and where annual precipitation is limited, and the largest rises of up to 120 feet are recorded in counties in southcentral, central and western Nebraska where extensive canals and surface-water irrigation systems seep into the aquifer. In addition to man-made changes that alter the water levels, natural changes in precipitation have an effect as well. 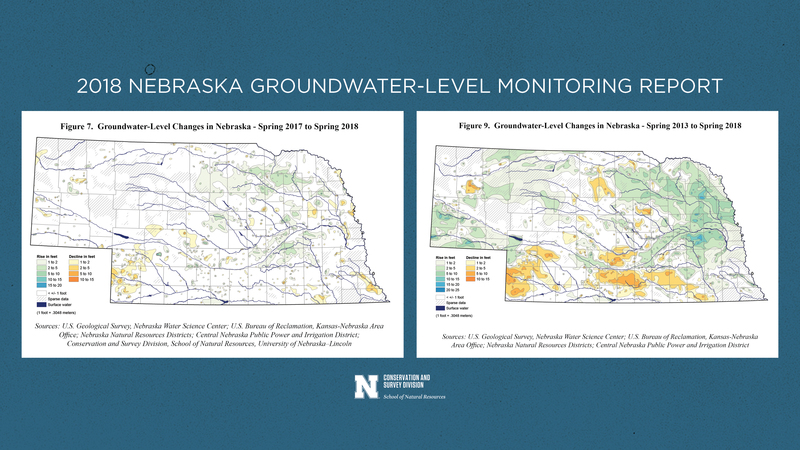 “Nebraska has an excellent system in place to monitor and react to groundwater-level trends and prevent problems,” Young said. It is just that system that helped portions of eastern and central Nebraska, which once had rapidly declining water levels, stabilize and in some cases begin recovery. In-depth maps in the report give visual representations of all of these changes over time, providing the information in one-year, five-year, 10-year and since-pre-irrigation (about 1950) increments. The maps are based on information collected by the Conservation and Survey Division, U.S. Geological Survey, U.S. Bureau of Reclamation, Nebraska Natural Resources Districts and Central Nebraska Public Power and Irrigation District, and are produced by CSD. Authors of this year’s report are Aaron Young, survey geologist; Mark Burbach, environmental scientist; Leslie Howard, geographic information science and cartography manager; Michele Waszgis, research technician; Susan Lackey, research hydrogeologist; and Matt Joeckel, state geologist and associate director for CSD and the School of Natural Resources. The report is available for $7 from the Nebraska Maps and More Store, 3310 Holdrege St., and also is available online at the Maps and More marketplace. Phone orders also are accepted at 402-472-3471, and a PDF of the report can be downloaded at go.unl.edu/groundwater. For more information, visit go.unl.edu/groundwater.